Mr Davis has studied with internationally recognized leaders in ear reconstruction including Dr Francois Firmin (France), Dr David Gault (UK), Dr S O Wickstrom (Sweden), Dr Burt Brent (USA), Dr David Fisher and Dr John Vandervord (Australia). His current technique is a mosaic of each of these experts techniques and he has performed ear reconstructions in Sweden, Australia, Sri Lanka and Malaysia as well as New Zealand. 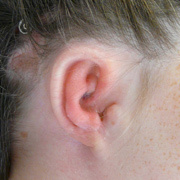 Meurmann Grade III microtia prior to framework elevation. Note position of BAHA well away from reconstructed ear. Meurmann Grade II microtia soon after framework elevation. Swelling obliterates the definition of the framework for many weeks after surgery during the second stage. 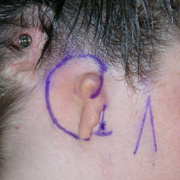 Ear reconstruction with tissue expanded flap and carved costal cartilage after severe otoplasty complication in another hospital. 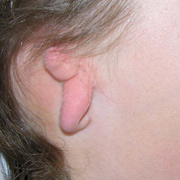 Ear anomalies result from either a deformation or a developmental malformation. 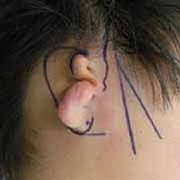 Deformational ear anomalies are best treated non-surgically with a splint within the first 3 months of life. 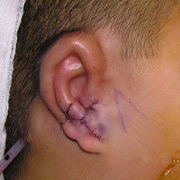 Malformations (including microtia and anotia) and ear defects following trauma such as a dog bite or a burn are best treated surgically. 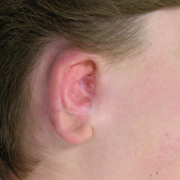 Anotia is complete absence of the outer ear at birth and microtia is the presence of a small ear or ear remnants. Microtia occurs in about 1 in every 3000 births and it may be isolated or part of a syndrome such as hemifacial microsomia, Goldenhar syndrome or Treacher Collins syndrome. There are about 20 new cases of microtia in New Zealand each year. 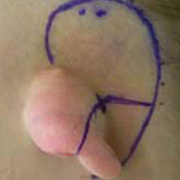 The new ear is made from the patients own tissues and requires at least 2 operations. In the first operation cartilage is taken from the rib cage and carved to create a framework that resembles a normal ear. 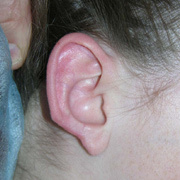 The other ear is used as a template if it is normal. This cartilage framework is inserted beneath a pocket of skin. This operation takes 3-4 hours and the child stays in hospital for about 2-3 days. 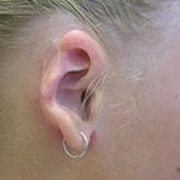 At this stage, the shape of the new ear can be seen but it will lie flat against the side of the head. 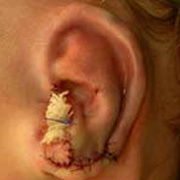 At the second operation the ear framework is elevated and the groove behind the ear created. This is normally done at least 4 months after the first operation to ensure a good blood supply to the cartilage framework. 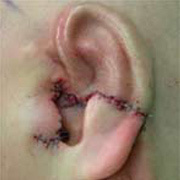 A flap of tissue from the scalp covers the back of the cartilage which is in turn covered by a skin graft. This operation takes about 3 hours and the child stays in hospital for 2 days. The new reconstructed ear is quite stiff and does not bend like a normal ear. However it is warm and will eventually get some feeling. Possible complications may include the need for revisions. 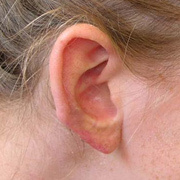 It is important to realize that the new ear will not be exactly like a normal ear. By age 4, the ear is nearly 85% of adult size. However the chest is not sufficiently grown and most ear reconstructions are usually postponed until about age 10 or older. The advantage of waiting is to ensure sufficient cartilage for the framework and less growth disturbance of the chest wall. Earlier surgery is considered when the child is suffering extreme psychological distress. Potential candidates for middle ear surgery are seen conjointly at the Microtia clinic with Dr Rebecca Garland, a consultant ENT surgeon who specialises in Paediatric Otology. 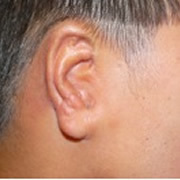 A prosthetic ear may be created using the normal ear as a template. Two operations will be required. At the first stage any ear remnants are removed and 3 titanium implants are embedded into the bone on the side of the head. At the second operation, usually 4 months later, a metal frame is attached to these implants. The prosthetic ear is clipped onto this metal frame.